So, you're already aware of the recreational value of the Salt Creek, and you probably checked out our Events page to participate with other creek enthusiasts. You already know that we all live in a watershed, and now you want to get a better understanding of how the watershed affects the creek. This is a good place to start. As you learn more about the creek and its watershed you'll find that there is a lot of technical, and not so technical, jargon that you will see again and again. This page will explain the jargon that you'll hear most often when talking about watersheds. Our Learn More page is also a wonderful learning resource. It has links to activities to do with young children, and high school level projects. Educators will find links to teaching resources. You can learn more about current Salt Creek watershed issues by visiting our Water Quality page. So let's begin. Unless otherwise stated these definitions are based on or quoted from the EPA publication - Terms Of Environment, or from the EPA or Illinois EPA website. A watershed is the area of land that drains into a stream. Where one watershed ends, another watershed begins. The Salt Creek Watershed is bounded by the DesPlaines River watershed on the east, and the DuPage River watershed and the Fox River watershed on the west. Webster's Dictionary defines Riparian as 'relating to or living or located on the bank of a natural watercourse (as a river) or sometimes of a lake or a tidewater'. Most often the term is used to refer to 'riparian corridor' or 'riparian habitat' which the EPA defines as 'areas adjacent to rivers and streams with a differing density, diversity, and productivity of plant and animal species relative to nearby uplands'. In other words, you're more likely to find different plants and animals in and along a waterway than you will find in areas away from the waterway. These plants and animals depend on the riparian habitat for life. Water quality standards prescribe the use of the water body and establish the water quality criteria that must be met to protect the designated use. 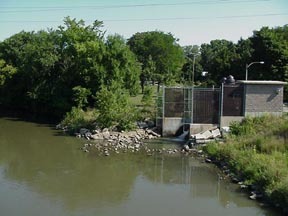 The Salt Creek is designated as 'General Use' by the Illinois EPA. The IEPA sets use standards for the state. You can learn more about water quality on our Water Quality web page. From the Illinois water quality 305b-2004 report: General Use Standards - These standards protect for aquatic life, wildlife, agricultural, primary contact, secondary contact, and most industrial uses. Primary contact use is defined as any recreational or other water use in which there is prolonged and intimate contact with the water (where physical configuration of the water body permits it) involving considerable risk of ingesting water in quantities sufficient to pose a significant health hazard, such as swimming and water skiing. Secondary contact is any recreational or other water use in which contact with the water is either incidental or accidental and in which the probability of ingesting appreciable quantities of water is minimal, such as fishing, commercial and recreational boating, and any limited contact incident to shoreline activity. These General Use standards are also designed to ensure the aesthetic quality of the state's aquatic environment. The presence of a substance in the environment that because of its chemical composition or quantity prevents the functioning of natural processes and produces undesirable environmental and health effects. Pollution in rivers and streams comes from the total watershed area, not only the land along the stream bank. The sum of all external conditions affecting the life, development and survival of an organism. The environment is where we live. A stationary location or fixed facility from which pollutants are discharged: any single identifiable source of pollution; e.g., a pipe or ditch. Whatever goes down your household drain can become a point source of pollution. Diffuse pollution sources (i.e., without a single point of origin or not introduced into a receiving stream from a specific outlet). The pollutants are generally carried off the land by storm water. Common non point sources of pollution for the Salt Creek are runoff from roads, parking lots, yards and driveways throughout the watershed. Having pores or openings that permit liquids (such as rain water) or gases to pass through. Not easily penetrated. The property of a material or soil that does not allow, or allows only with great difficulty, the movement or passage of water. In 1996, land cover in the Salt Creek watershed consisted of 77% urban land, 15% woodland, 4% wetland, and 4% other. Not permitting penetration or passage of water. Growing public awareness and concern for controlling water pollution led to enactment of the Federal Water Pollution Control Act Amendments of 1972. As amended in 1977, this law became commonly known as the Clean Water Act. The Act established the basic structure for regulating discharges of pollutants into the waters of the United States. It gave EPA the authority to implement pollution control programs such as setting wastewater standards for industry. The Clean Water Act also continued requirements to set water quality standards for all contaminants in surface waters. You can learn more about the Clean Water Act through the online course Understanding the Clean Water Act presented by River Network. Methods that have been determined to be the most effective, practical means of preventing or reducing pollution from non point sources. We have a complete BMP manual you can download from our publications page. A more complete glossary of terms can be found in our booklet Restoring Balance page 13.